Costa Rica is ideal for thrill-seekers. 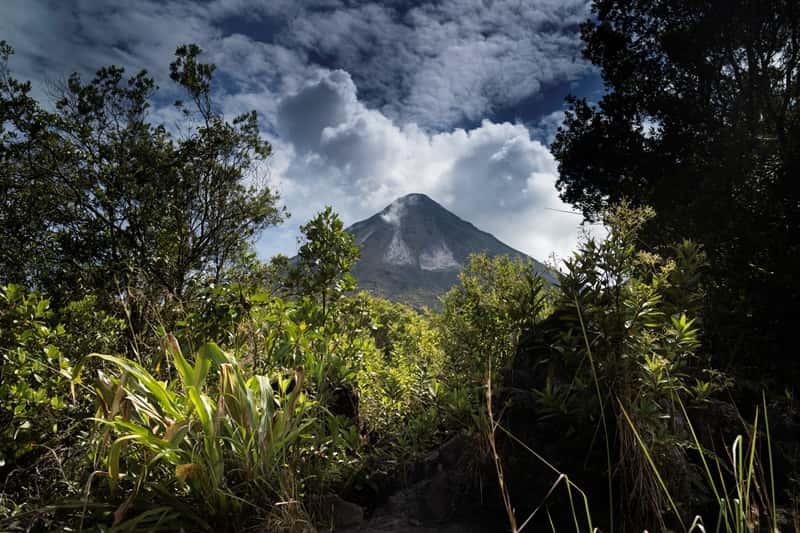 Fly down zip-wires over the jungle and walk on volcanoes in the same day. And for wildlife-lovers, stay in the rainforest and search for sloths. Listen to a chorus of crickets, frogs and more - from silence to a cacophony as the sun sets. Costa Rica has such a diverse climate that there is really no bad time to visit - it just depends what your priorities are. Broadly speaking, Costa Rica is at it's driest and sunniest from December to April on the Pacific side, and from March to September on the Caribbean side. The 'green' season (rainy season) is usually from the end of April to the start of October, everywhere aside from the Caribbean coast which has its dry season at this time. Confused yet?! Due to Costa Rica's dry season, the peak times of December to mid-January can be busy, with tourist numbers increased particularly on the dry Pacific side and in the central mountainous zone. If you want to travel to Costa Rica in the dry season, we'd recommend February and March as slightly quieter months. This is also a great time to visit the beaches around Manuel Antonio and Dominical for a bit of sun and relaxation after an adventurous trip. However, the 'green' season is also an excellent time for a holiday in Costa Rica - the rainforest is lush and green for a reason, and the early months of the rainy season in May and June can be one of the best times to appreciate the verdant forest. Importantly, between July and early October is turtle nesting season in Tortuguero, with the hatchlings emerging around two months after the eggs are laid. Contrary to the rest of the country, this is the dry season so it's also a perfect time to explore the waterways and canals that are within the national park. Whenever you decide to travel, it's important to remember that there is a reason why Costa Rica is filled with 'rain'forest. It can rain at any time, but we recommend packing a poncho, a sturdy pair of shoes, and a good attitude to get out into the forest and enjoy it! As well as being consistently one of the world's happiest countries, Costa Rica is renowned for its high-octane thrills and amazingly diverse ecosystem (which accounts for over 5% of the world's plant and animal species, on just 0.03% of the earth's surface). But what can you expect from a adventure and wildlife holiday to Costa Rica? We've put our top five adventure and wildlife moments together to fulfil your ultimate Costa Rica holiday experience. 1. Zip-lining is an integral part of any Costa Rica trip. With a wide range of wires to choose from in many of the national parks, its never been easier to fly through the air, finding toucans and monkeys in the jungle canopy as you stand on a 100-foot hanging platform. 2. Costa Rica's hanging bridge experiences are an awesome way to combine wildlife and adventure, getting you up to canopy-level and having a birds-eye view of the jungle floor. 3. Whitewater rafting is one for the real thrill-seekers. You can get out onto the class III-IV rapids of the Pacuare River and be paddling through the stunning forest scenery in no time. 4. Discovering Costa Rica on two wheels means more access to hidden corners of the country: freewheeling down the side of a volcano or exploring tiny off-the-beaten-track villages that tour buses aren't able to reach. 5. While maybe not the most high-octane of Costa Rica's adventure pursuits, a night walk in the forest can be just as thrilling as rafting or zip-lining - imagine turning off your torch and walking head first into a giant spider's web, or uncovering tree snakes dangling from the branches overhead. In the forest you never know what is going to happen! 1. Green turtles. See these magnificent creatures nesting on the beaches of Tortuguero from June to October - this National Park is one of the most important green turtle nesting sites in the western Caribbean. 2. Quetzals. Get your binoculars at the ready for this one - the elusive resplendant quetzal is Costa Rica's hallmark bird. Endangered and very difficult to spot, it's definitely one to write home about. 3. Keelbilled Toucan. These birds are postcard-worthy for their beautiful long, colourful beak. If you're travelling into the Monteverde Cloudforest Reesrve, you're likely to see these travelling in small flocks, and hear them singing to you. 4. Orchids. Home to an incredible 1300 identified species of orchid, this is one flower that should make your bucket list. Costa Rica's national flower is a type of orchid - the Guaria Morada, a rich purple-coloured flower that blooms from January to April. 5. Sloths. This is usually on the top of a must-see wildlife list, so it's fortunate that you can find them almost everywhere in Costa Rica - even hanging by the side of the road! Manuel Antonio National Park is a great place to spot them, as it has clear and wide trails with lots of room to look around at the canopy.